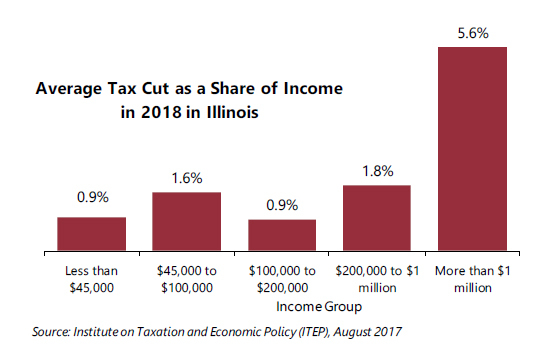 The first group, the millionaires, would receive an average tax cut of $162,580 in 2018, equal to 5.6 percent of their income. The second group, those making less than $45,000, would receive an average tax cut of just $230, equal to 0.9 percent of their income. The figures in this brief have been calculated by the Institute on Taxation and Economic Policy (ITEP) based on broad principles for tax policy released by the Trump administration on April 26 as well as subsequent statements by administration officials. Because the principles and statements left many unanswered questions, the estimates required some assumptions. ITEP’s longer report explains these assumptions and each tax proposal in detail. That report concludes that the Trump tax principles would reduce revenue by at least $4.8 trillion over 10 years. 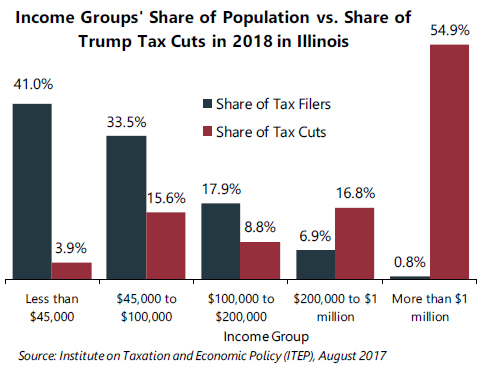 The Trump tax proposals included in these figures are the following, which are described in more detail in ITEP’s longer report.